Schistosoma mansoni harbors a population of stem cells (yellow dots) that replenish its tissues and help it live in its host for decades. Photo by Jim Collins, University of Illinois. [National Institutes of Health] – The flatworms that cause the tropical disease schistosomiasis can live and reproduce inside infected humans for decades. In a new study, researchers identified the stem cells that may be responsible. The discovery could lay the groundwork for new strategies to treat the devastating disease caused by the parasite. Schistosomiasis, also known as bilharzia or snail fever, primarily affects people living in the tropical regions of developing countries. Children who are repeatedly infected can develop anemia, malnutrition and learning difficulties. After years of infection, the parasite can damage the liver, intestine, lungs and bladder. Rarely, it can also cause seizures, paralysis or spinal cord inflammation. More than 200 million people have this disease and more than 700 million people are at risk of infection. Microscopic Schistosoma parasites infect people who are wading, swimming or bathing in freshwater inhabited by infected snails. The parasites, known as schistosomes, burrow into human skin and then grow inside blood vessels. Female worms produce eggs that can travel to the intestine, liver, bladder or other organs. The eggs can be released back into the water through urine or feces, starting the cycle again. Dr. Phillip Newmark and colleagues at the University of Illinois have spent years studying flatworms. They knew that planarians, non-parasitic worms popular in biology classrooms, have a type of stem cell known as a neoblast. 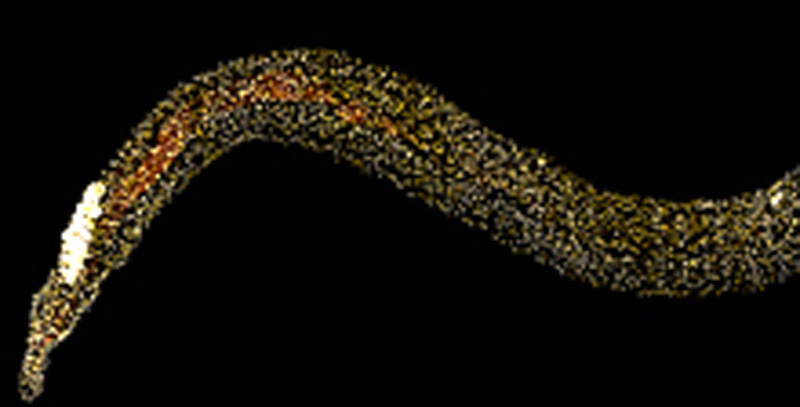 Neoblasts allow planarians to regenerate damaged organs and body parts. The scientists wondered whether schistosomes might have a similar type of stem cell. Their study, described in Nature on February 28, 2013, was funded in part by NIH’s Eunice Kennedy Shriver National Institute of Child Health and Human Development (NICHD) and National Institute of Allergy and Infectious Diseases (NIAID). The scientists used a labeling technique to identify a population of cells from schistosomes that was able to grow and divide. They found that these cells had a distinct structure and pattern of gene expression similar to neoblasts. When the researchers used a fluorescent marker to tag the cells, they detected the marker in new cells 3 days later. This ability to divide and produce new cells is a key characteristic of stem cells. The scientists injected schistosome-infected mice with a marker to look at the pattern of tagged cells at several time points. They located the tag in intestinal cells and in body wall muscle cells of the parasite after 7 days. This revealed that the cells could turn into different types of cells (differentiate), another key behavior of stem cells. The team next turned their attention to signal pathways that might exist within these stem cells. Using their knowledge of planarians, they focused on the fibroblast growth factor (FGF) receptor family, which is expressed in proliferating planarian cells. They identified a gene, SmfgfrA, in the adult stem cells that codes for the parasite’s version of a FGF receptor. Using a technique called RNA interference (RNAi), they turned off the gene and found that it’s required for maintenance of the stem cells in the worm.